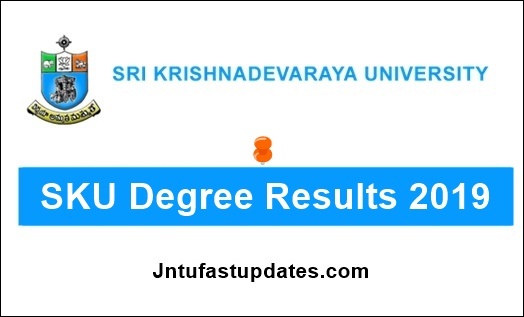 SKU Degree Results 2019: Sri Krishnadevaraya University has successfully conducted the Graduate Degree 2nd, 4th, 6th Semesters examinations March/April 2019. Many of the students undergoing the Degree course such as BA, B.Com, B.Sc, BBA, BBM, and other graduate degree courses have appeared for the semester examinations as per the scheduled timetable. The SKU UG examinations conducted in a vast number of its affiliated colleges. Candidates waiting to check the SKU UG Summer results 2019, university announces the results. Students can keep checking the official website, skuniversity.ac.in. Students can keep visiting the official portal for up to date announcements. Sri Krishnadevaraya University is one of the well-known universities of India. The SKU was established in the year of 1976. It offers various Degree and Postgraduate Degree courses for the students. The SKU conducts the examinations in the semester system. The SKU offers various Graduate Degree/UG courses such as B.Tech., B.Pharmacy., B.A, B.Sc, BEd, B.P.Ed, B.Com, BBM and Postgraduate Degree courses such as M.Pharmacy, M.Tech, MCA, MBA, MA, M.Sc, M.Com, M.P.Ed, MSW, M.Li.Sc, PGDISM, M.Phil, & Ph.D. courses. Annually a huge number of students comes out with certification from the SKU. The SKU has conducted 1st, 3rd, 5th semester examinations from 22nd October to 15th November. Sri Krishnadevaraya University is expected to release the Degree 2nd, 4th and 6th semester results in the months of May, 2019 (tentatively). Candidates attempted the Degree Examinations such as B.Com., BA, B.Sc., BBM and other courses can check the results for even semesters (2nd, 4th, 6th). Students those have not got the satisfactory marks in the exams can apply for revaluation/recounting as per their interest. The University shortly announces the revaluation/recounting dates and also the subject-wise fee to be paid for each paper. Students those have failed in the examinations can apply for supplementary examinations. The supplementary examinations will be held in August/September months. The SKU Degree Supplementary Timetable 2019 will be released shortly. Candidates can stay visiting the SKU official portal, Skuniversity.ac.in for latest notifications and updates from the university. Candidates can check the SKU UG Results 2019 from the other popular result portals such as manabadi, schools9, vidyavision.com and others. Students may not access their results from the official portal due to huge traffic. Hence students can go to alternative portals to check their results. All the students of UG Courses (B.A., B.Sc., B.Com. and B.B.A) who appeared for II, IV and VI Semesters Examinations (Regular and Supplementary) of S.K. University held in March/April, 2019 are hereby informed that the Results, announced in May. The Sri Krishnadevaraya University Degree result, marks, appears on the screen. Maa results avado chudalaemi be .ma results net peteki kuda baruva miku. Sku entha leziga pani chesthundani anukoledu.